We believed that many investors are confused. What is the perfect number to fill out on the form? The more digits you write down, the more taxes you are going to pay. Even your digits are shorter, the Revenue Department officer will defenitely shoot hundred of questions at you. Or worse, your Income Tax Return might be retroactively re-audited until migraine knocks at your door. Income Tax Return that we are going to discuss in the article is Income Tax Return P.N.D. 50. P.N.D. is Thai code name for income tax, P.N.D. 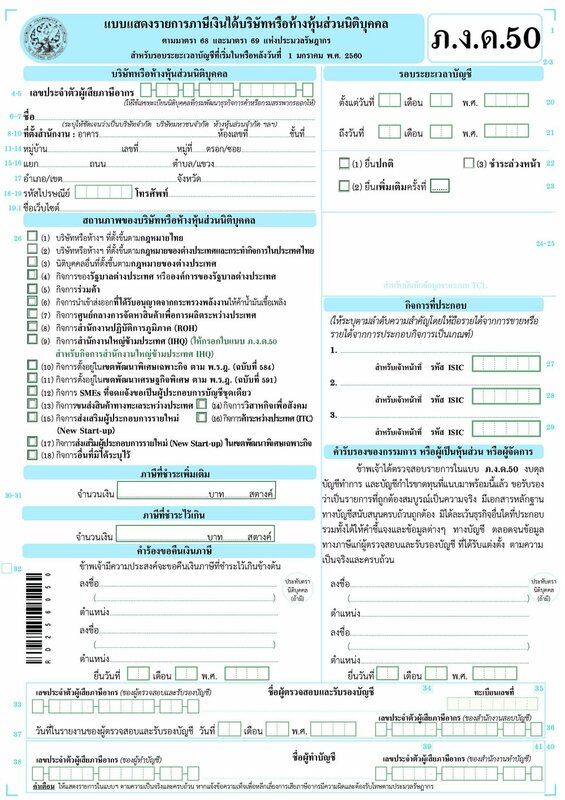 50 is Income Tax Return for juristic person which is registered within both Thai law and foreign law. The investors must submit P.N.D. 50 within 150 days from the final day on accounting period (within 31st May). Income Tax Return must be submitted annually whether the investors have income or not. Item 9 Expenses not treated as expenses under the Revenue Code. Item 10 Revenues that are granted income tax exemption or expenses that are deductable at a greater Business granted income tax exemption. Item 11 Net losses adjusted under the Revenue Code and carried over for a period that does not exceed five accounting periods before the current accounting periods, or net losses before the current accounting periods that are deductible under other laws. Item 3 is the important example from Income Tax Return P.N.D. 50 that investors should be focused on. This item has summarized revenue expenditures, net profits or loses, related to taxes that the investors have to pay. Four items are related to adjusting net profits; tax revenue, exempted revenue, forbidden expenditures and other expenditures. According to the details in the previous article, other items are also related to details in chapter 2 and 3. In reality, there are slightly investors who honestly fill out their information on the Income Tax Return. The main reason is that they are avoiding paying great amount of taxes. However, if you write down the false numbers no matter with long digits or short one, the Revenue Department might have an eye on you and expect your further explanation.